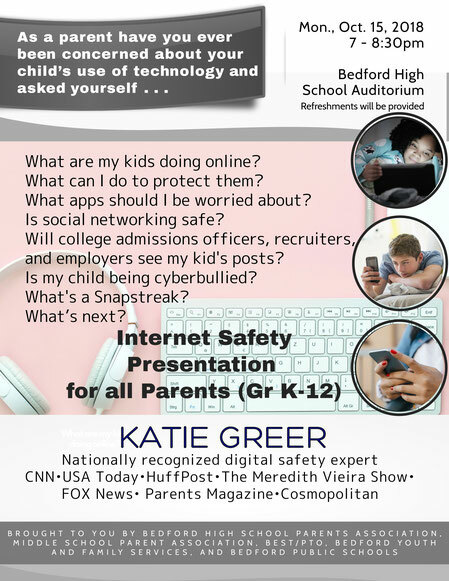 The BHSPA and other PTOs of Bedford, specifically, BEST/PTO for the elementary schools and the Middle School Parent Association, as well as Bedford Youth and Family Services and the Public Schools, were very pleased to bring speaker Katie Greer to town. During the morning and afternoon of October 15, 2018, in the Bedford schools, Katie spoke directly to the students during assemblies at JGMS (Gr. 6, 7, 8), BHS (Grades 9, 10, 11 & 12), and Lane (Grades 4 & 5.) There was a Parent Presentation at BHS Auditorium that night. High school kids have seen it all and really are in the thick of creating online reputations, whether they know it or not. What they often don’t understand is that people besides their friends, such as colleges, law enforcement, principals, parents, and potential employers, may be looking in on these behaviors regularly. With everything today being chronicled on social media, it’s important that students this age fully understand where things go and how it can impact them today or 5-10 years down the line.